By Keith Cowing on December 31, 2007 4:16 PM. "He dismissed suggestions that NASA chose to release the data late on New Year's Eve, when the public is distracted by holidays and news organizations are thinly staffed. "We didn't deliberately choose to release on the slowest news day of the year," Griffin said." "Release of the requested data, which are sensitive and safety-related, could materially affect the public confidence in, and the commercial welfare of, the air carriers and general aviation companies whose pilots participated in the survey," Luedtke wrote in a final [FOIA] denial letter to the AP. By Keith Cowing on December 31, 2007 2:46 PM. "This Web site contains responses collected from the air carrier and general aviation pilot surveys as part of the NASA National Aviation Operational Monitoring Service (NAOMS) project from April 2001 through December 2004. Relevant information is contained in the accompanying documentation. In the interest of timeliness, this first release is by nature conservative to ensure the responses do not contain confidential commercial information or information that could compromise the anonymity of individual pilots. Efforts will be made in 2008 to release additional NAOMS information that was redacted for this release." "At our October 31 hearing, NASA agreed to release the NAOMS data by year's end. I am pleased they've met that initial commitment, however NASA itself concedes that this is not the most complete data set that they intend to release. I expect NASA to complete the data release process as soon as possible. Excessive delay would be in no one's best interest." "NASA will hold a media teleconference on Monday, Dec. 31 at 1 p.m. EST, to discuss its release of the National Aviation Operations Monitoring Service (NAOMS) data." "NASA expected to release results Monday from an $11.3 million federal air safety study it previously withheld from the public over concerns it would upset travelers and hurt airline profits. The research conducted over four years shows that safety problems like near collisions and runway interference occur far more frequently than previously recognized. NASA promised to publish on its Web site some results of its survey. But it indicated that the data being released on the afternoon of New Year's Eve would be published as formatted. It said the data would come in printed reports rather than in any tabular data format that would make analysis by outsiders easier." Subtle Hints About Shuttle Fleet Ops Extension? By Keith Cowing on December 30, 2007 6:46 PM. "The cost plus no fee contract will provide support for activities related to both the Space Shuttle Program and International Space Station Program. The contract includes a base period from Jan. 1, 2008, to Sept. 30, 2010, followed by two one-year extension options." Editor's note: Hmmm ... if the Shuttle fleet is supposed to be retired in 2010, why is there any need for "two one-year extension options" for hardware that is only used on the Space Shuttle? Editor's update: According to PAO's Michael Curie "The two option years are for space station, not shuttle, robotics." OK. Then perhaps the title of the press release should have been "NASA Awards Contract for Space Shuttle and Space Station Robotics Support" and the lead paragraph changed to something like "for support of hardware and software associated with the Space Shuttle Remote Manipulator System robotic arm, inspection boom assembly and robotic work station and for International Space Station robotic hardware and software". Otherwise the release, as written, seems to focus only on shuttle-based hardware - since it is the only hardware that is specifically mentioned. By Keith Cowing on December 28, 2007 2:41 PM. "Updated Dec. 28, 2007 -- Astronomers have identified asteroid 2007 WD 5 in archival imagery. With these new observations, scientists at NASA's Near-Earth Object Program Office at the Jet Propulsion Laboratory in Pasadena, Calif have refined their trajectory estimates for the asteroid. Based on this latest analysis, the odds for the asteroid impacting Mars on Jan. 30 are now 1-in-25 -- or about 4 percent." By Keith Cowing on December 28, 2007 10:03 AM. Editor's note: After several months of making the daily ISS On Orbit Status Reports available to the public on its HQ website, NASA has now decided (so it would seem) that these reports are not going to be available. When you visit this link which once provided these reports you now get this message "Attention! You have requested information which can be accessed only from a NASA facility..."
Editor's Update: I just got a call from NASA PAO. Apparently there was a server issue that blocked access inside NASA as well. NASA IT folks have restored access. By Keith Cowing on December 27, 2007 3:20 PM. "Today, I signed into law H.R. 2764, legislation that will fund the Federal Government within the reasonable and responsible spending levels I proposed -- without raising taxes and without the most objectionable policy changes considered by the Congress. This law provides a down payment for the resources our troops need, without arbitrary timelines for withdrawal. The Congress should quickly take action next year to provide the remainder of the funding needed by our troops." By Keith Cowing on December 27, 2007 3:11 PM. Editor note: NASA held a teleconference today with Wayne Hale with regard to repairs needed for STS-122. According to Wayne Hale "We have no launch date to talk about today". Hale said that NASA would attempt to do all required repairs to Atlantis' External Tank on the launch pad. Hale expressed confidence that the repairs could be done in this fashion. However, if that is not possible, then a roll back to the VAB might be needed. By Keith Cowing on December 27, 2007 1:25 PM. "Alan Stern, Associate Administrator for Science Mission Directorate (SMD), has initiated an effort to simplify NASA Announcements of Opportunity (AOs). AOs are issued by NASA to solicit proposals for complete PI-led missions (like Explorer, Discovery, Mars Scout, etc. ), for smaller PI-led missions of opportunity, and for instruments for NASA's strategic missions (like recent AOs for RBSP, MMS, MSL, JWST, etc.). This AO simplification effort is being led by Paul Hertz, Senior Advisor in SMD at NASA Headquarters responsible for the AO process, and Brad Perry, Head of the Science Support Office at NASA Langley research center and responsible for the technical/ management/ cost (TMC) review process." By Keith Cowing on December 26, 2007 1:00 PM. "NASA will wait two years longer than planned and spend another $40 million to launch a half-billion-dollar probe to Mars because of an unspecified conflict of interest in the purchasing process, officials said Friday." "NASA announced today that the next mission in the Mars Scout program, originally planned for launch in 2011, is now targeted for launch in 2013." "Since I was not at all sure what to make of this, I had to call my boss, Executive Director Lou Friedman, and find out what he thought. He said he didn't have a full understanding yet of what was behind the decision but he deplored, he said, the flouting of Congressional will that had just been expressed on Tuesday; Congress expressed to NASA that Mars missions should be launched at every opportunity. And to wait to make the announcment until after Congress went home for the holidays -- that seems designed to try to make the announcement fly under the radar. He also seemed a bit disgusted that the delay should be for such a bureaucratic reason. I'm sure you'll be hearing more from him on this once we all have a better idea what happened." Editor's 21 Dec note: Atta boy Lou - read, fire, aim. You might want to do a little research before you go into armwaving conspiracy mode on your organization's website. I sincerely doubt that a little cabal of NASA HQ folks had this all planned - just as you hypothesize - such that they could deliberately "flout" Congress - and do so when Congress was home for the holidays - oh yes, with no one noticing. Get a grip, Lou. By Keith Cowing on December 24, 2007 3:04 PM. Editor's note: Looks like NORAD got a graphics upgrade such that actual Santa Claus imagery (below) and situational awareness of proximity operations with the ISS can be obtained. Continue reading Today's Video: Santa Prox Ops With ISS. By Keith Cowing on December 24, 2007 3:03 PM. By Keith Cowing on December 22, 2007 4:20 PM. "a) Use of Space Shuttle for Access to Space- NASA shall fly at least 2 Space Shuttle missions per year for crew transport, instead of Russian crew and cargo services, for the period of 2010 through 2015, or until Orion is operational. There are authorized to be appropriated to NASA such sums as may be necessary, in addition to amounts otherwise authorized, to carry out this subsection, including for the production of more external tanks as may be needed." Editor's note: Rep. Weldon is exorcising some non-space demons at the same time that he is trying to prolong shuttle operations. This legislation also includes a large amount of Russia-bashing - much of it gratuitous - much more than is needed to make the simple point (agreed to by many) that the U.S. should not be reliant upon Russia (or any other country) to fly American astronauts. i.e. "Despite United States objections, Russia sold billions of dollars worth of weapons to the regime of Hugo Chavez in 2006. Such meddling is a possible violation of the Monroe Doctrine and a throwback to the Cold War era." By Keith Cowing on December 20, 2007 9:53 PM. "NASA will hold a media teleconference at 11 a.m. EST, on Friday, Dec. 21, to make an announcement about the schedule for evaluating its Mars Scout program." By Keith Cowing on December 20, 2007 9:18 PM. "An asteroid similar to the one that flattened forests in Siberia in 1908 could plow into Mars next month, scientists said today. Researchers attached to NASA's Near-Earth Objects Program, who sometimes jokingly call themselves the Solar System Defense Team, have been tracking the asteroid since its discovery in late November. The scientists, based at the Jet Propulsion Laboratory in La Caada Flintridge, put the chances that it will hit the Red Planet on Jan. 30 at about 1 in 75." Editor's note: Oddly enough, there is no mention of this potentially excting event on NASA JPL's Near Earth Object Program website or on JPL's news page. Nor is there any mention at NASA HQ's SMD page. Editor's update: Someone just sent me this link that they found at JPL showing the orbit of asteroid 2007 WD5. By Keith Cowing on December 20, 2007 3:57 PM. "NASA/LaRC has a requirement for Use of the proprietary Universal Combustion Device Stability (UCDS) process developed and owned by the Gloyer-Taylor Laboratories LLC. The Government must assess thrust oscillation issues with the Constellation Program's ARES five-segment solid rocket booster. The Gloyer-Taylor Labs UCDS is a breakthrough modeling and analysis process, which provides detailed physical insight into the stability characteristics of complex combustion devices. Using calculations that are based entirely on known or measurable parameters, the UCDS makes it possible to predict for a given initial state the actual wave geometry, time history of the wave amplitude, limit amplitude reached by the wave system, and accompanying changes in the combustion chamber state properties. Design of corrective procedures can be accomplished with full physical understanding of the action of damping mechanisms." By Keith Cowing on December 20, 2007 12:47 PM. "The "brains" of the Ares I rocket that will send four astronauts back to the moon sometime in the next 12 years will be built by Boeing, NASA announced todaybut the specifications will be open-source and non-proprietary, so that other companies can bid on future contracts. The avionics unit will provide guidance, navigation and control for the launch rocket, which will carry the Orion crew vehicle into Earth orbit." Editor's note: Given the increased labeling of all things associated with Ares 1 as being ITAR sensitive I am not certain how NASA is going to truly do this "open source" stuff. Editor's update: According to a NASA source: "The IU/avionics and software are owned, developed, and designed by the NASA One Team. This is not open sourced. The SAS, CEI specs, etc. are all ITAR-Export controlled." By Keith Cowing on December 19, 2007 8:03 PM. "The 90-year-old mother of an astronaut aboard the international space station was killed Wednesday when her car was struck by a freight train in a Chicago suburb. A NASA flight surgeon in Mission Control informed astronaut Dan Tani of the death of his mother, Rose Tani, while he was orbiting about 220 miles above the Earth." By Keith Cowing on December 19, 2007 6:38 PM. "Another academic likely to be making the January chat-show circuit is James Hansen. Mark Bowen's ``Censoring Science: Inside the Political Attack on Dr. James Hansen and the Truth of Global Warming'' ($25.95) hits the shelves on Dec. 27." By Keith Cowing on December 19, 2007 8:20 AM. "Congressman Dave Weldon is right to be concerned about the looming gap between the space shuttle's retirement in 2010 and the launch of NASA's next manned vehicle in 2015 or later. But he's also right that his plan to fill the gap isn't very likely to pass. Actually, it has about a daisy's chance on the moon." Editor's note: I will be on CNN - live - today (Wednesday) around 11:15 am EST. Update - I will be on CNN International - not CNN Domestic so it would seem. By Keith Cowing on December 19, 2007 8:15 AM. "After Tuesday's test of Atlantis' external fuel tank, NASA's Space Shuttle Program Manager Wayne Hale said he was pleased with the data captured from the special equipment wired into the tank's sensor system. Speaking from NASA's Johnson Space Center in Houston, Hale said with the information gleaned from the test "sets us on the right path to correct this problem so we can return this important safety system to operational capability so we can fly again." By Keith Cowing on December 19, 2007 12:03 AM. "The mission of One Laptop Per Child (OLPC) is to empower the children of developing countries to learn by providing one connected laptop to every school-age child. In order to accomplish our goal, we need people who believe in what were doing and want to help make education for the worlds children a priority, not a privilege. Between November 12 and November 26, OLPC is offering a Give One Get One program in the United States and Canada. During this time, you can donate the revolutionary XO laptop to a child in a developing nation, and also receive one for the child in your life in recognition of your contribution." Editor's 12 Nov note: I just bought two (i.e. donated one). You should too. Editor's 26 Nov update: This program has been extended to 31 December 2007. Editor's 18 Dec update: I got my OLPC XO laptop today. It is an interesting device. Certainly rugged. In some ways it is intuitive - in other ways (i.e. to my 52 year old brain) somewhat counter intuitive. But it is not designed for me. It is designed for children - children who may have never touched electronics before - their gateway to the modern, globalized, interconnected world. As such, this is a potentially powerful device. Once you get through a few things it is remarkably straightforward to use. I get the feeling someone in a third world community is going to submit the equivalent of their application to Starfleet Academy on this device. More to follow. Images taken inside one of the Insert Studios at CNN's Washington Bureau on 19 December 2007 [Left] me and the backdrop taken by my XO laptop. [Right] My XO laptop sitting on a chair in the studio. Click on images to enlarge. Continue reading Donate an XO laptop to a child in a developing nation. By Keith Cowing on December 17, 2007 11:13 PM. "That, of the amounts provided under this heading, $5,577,310, 000 shall be for Science, $625,280,000 shall be for aeronautics research, $3,842,010, 000 shall be for exploration systems, and $556, 400, 000 shall be for cross-agencys upport programs: Provided further, That the amounts in the previous proviso shall be reduced by $57,900,000 in corporate and general administrative expenses and the reduction shall be applied proportionally to each amount therein: Provided further, That none of the funds under this heading shall be used for any research, development, or demonstration activities related exclusively to the human exploration of Mars." "NATIONAL AERONAUTICS AND SPACE ADMINISTRATION The amended bill provides $17,309,400,000 for the National Aeronautics and Space Administration (NASA) instead of $17,622,500,000 as proposed by the House and $17,459,600,000 as proposed by the Senate. The Senate bill included an additional $1,000,000,000 designated as an emergency requirement. The amended bill does not include this emergency funding." Continue reading Bad Budget News For NASA. By Keith Cowing on December 17, 2007 10:32 PM. "[Weldon's] proposal, which would cost about $10 billion, would have the shuttles make six or seven additional flights between 2010 and 2013 and speed up development of the Orion ships to be ready by then. A second proposal would keep the shuttles flying until 2015 and leave Orion's schedule alone." By Keith Cowing on December 17, 2007 11:25 AM. "Today in class [name] had a program launched called Foxfire.exe. I had told [name] to close the program and to resume work but he told me that is was just a different browser and that he was doing his work. I had given him two warnings but he insisted that it was just a "better" browser and he wasn't doing anything wrong. I had then issued his detention." Editor's update: Looks like this was a widely-propagated hoax. By Keith Cowing on December 17, 2007 10:18 AM. "Toby Garfield, an oceanographer at San Francisco State University, was explaining the science of big ocean waves, like the giant Mavericks surf break about 25 miles away. As he showed slides of the ocean floor and explained that the coast is a system of energy dissipation, the crowd peppered him with questions. Why do waves come in sets? What are rogue waves? How is the United States harnessing the power of waves to make renewable energy? Scenes like this are being repeated across the country at science cafes, where contemporary science -- a topic that Americans supposedly find dull -- is drawing substantial crowds month after month, even on topics as nerdy as gene sequencing and dark matter." By Keith Cowing on December 17, 2007 9:10 AM. reader note: "Dr. Robert E. Shurney recently passed away in Huntsville, Alabama. Dr. Shurney, a retired Marshall Space Flight Center engineer, accomplished several major and significant tasks for NASA." Continue reading Dr. Robert E. Shurney. By Keith Cowing on December 17, 2007 12:25 AM. "I'm not sure if 'suggest a story' is the right heading, but here goes anyway. I live on Kangaroo Island, South Australia, and found your site while trying to find recent pictures of our Island from space, on the net. ... Most of theses fires have destroyed conservation parks, and probably incinerated thousands of our native animals, plus burnt onto several farms, killed about 800 sheep, and taken the precious life of one of our young local men. About 700 firefighters from around Australia and a number of water bombers were sent to fire the fires, which are now said to be 'contained'." Editor's 17 Dec update: Response (with images) from Matt Hancher, Lead, NASA/Google Planetary Content Team, NASA Ames Research Center: "In response to your question on SpaceRef and NASAWatch about additional NASA imagery of the Kangaroo Island fire: this is actually something that NASA (specifically the Earth Observatory team at Goddard in conjunction with the University of Maryland) has been doing quite well for years through the MODIS Rapid Response (MRR) project." White House Direction: Open For Interpretation By NASA? By Keith Cowing on December 17, 2007 12:05 AM. "Beginning no later than 2008, we will send a series of robotic missions to the lunar surface to research and prepare for future human exploration." "NASA has reserved time for a later launch in case it can't meet its Oct. 28, 2008 target date to send the Lunar Reconnaissance Orbiter (LRO) to the moon." Editor's note: Gee Mike, if you miss the 2008 time frame mandated by the White House, what does this say about the need to adhere to the 2010 shuttle retirement date? If you are going to invoke White House direction in terms of what you do - and when - then you can't ignore one deadline and enforce the other - and expect people to take your rationale seriously. By Keith Cowing on December 16, 2007 11:58 PM. "Rep. Weldon is announcing new legislation that would propose additional Space Shuttle flights through the "gap" in which America will not otherwise have access to space. This legislation will also provide additional resources for the Constellation project, and will have a positive effect on our national security as well as the local economy." By Keith Cowing on December 16, 2007 5:47 PM. "Tyson is a 6-foot-4 African American who today is wearing a dark suit and a vest knitted with white suns, each with a human face. It's the vest of a guy who (a) believes he is the universe's ambassador to Earth and (b) does not care what you think of his vest. Part of being a geek, Tyson says, is not worrying about whether you fit in, and for as long as he can remember, he's been a geek. Last month he took an online test to determine exactly how geeky he is. He scored high." By Keith Cowing on December 16, 2007 1:42 PM. "The federal role in precollege science, technology, engineering, and mathematics (STEM) education is receiving increasing attention in light of the need to support public understanding of science and to develop a strong scientific and technical workforce in a competitive global economy. Federal science agencies, such as the National Aeronautics and Space Administration (NASA), are being looked to as a resource for enhancing precollege STEM education and bringing more young people to scientific and technical careers." By Keith Cowing on December 16, 2007 1:19 PM. "The proposal to send a unmanned mission called Moonlite into orbit around the Moon has the backing of those planning Nasa's own return to the Moon. The US space agency's administrator, Dr Michael Griffin, has said that he is keen to use UK expertise to carry out scientific studies." By Keith Cowing on December 15, 2007 1:21 AM. Editor's note: New ways of communicating are always appearing on the Internet - often out of nowhere. Twitter is one of the most fascinating - and infectious. I am now an addict - as are many of the folks at NASA who see how the future will work. You can follow my Twitter postings here - and I encourage you to get a Twitter account yourself. For a snapshot of how this all works globally, have a look at Twittervision - click on the 3D option and watch as instantaneous Twitter postings (called "Tweets") are mapped against a planetary context - in near real time. By Keith Cowing on December 15, 2007 12:02 AM. "This week, NASA released e-mails offering a glimpse into how the agency handled the scandal. One officer's e-mail suggested trying Nowak (who, along with her love interest, is no longer a member of the astronaut corps) in military court to limit media access, a suggestion the agency quickly dismissed. So how did the space crew do in fending off these public-relations asteroids? NEWSWEEK spoke with Gene Grabowski, vice president of Washington, D.C.-based Levick Strategic Communications, who worked damage control on the national pet-food recalls and the toxic Chinese toy imports earlier this year." By Keith Cowing on December 13, 2007 10:34 PM. "Over the past several days, New Yorkers have had a chance to see what the next Challenger Learning Center will look like. The facility will be located in Mount Laurel Township, New Jersey and wadesigned by Cubellis, a national architectural, interior design, and engineering firm. Visitors to Times Square have been shown a large electronic advertisement by PRNewswire at 3 Times Square featuring a press release and an image of the new Learning Center." By Keith Cowing on December 13, 2007 7:14 PM. "If there was a romantic relationship brewing between former astronaut Lisa Nowak and Navy Cmdr. Bill Oefelein, it didn't come through in their e-mail exchanges at work, according to newly released NASA documents. But passion was evident in notes between Oefelein and Air Force Capt. Colleen Shipman, the woman Nowak saw as her romantic rival and is accused of following to Florida and attacking in February at Orlando International Airport." By Keith Cowing on December 13, 2007 6:29 PM. NASA Targets Space Shuttle Atlantis Launch On Jan. 10"The workforce has stepped up to and met every challenge this year," said Wayne Hale, Space Shuttle Program manager at NASA's Johnson Space Center. "Moving the next launch attempt of Atlantis to Jan. 10 will allow as many people as possible to have time with family and friends at the time of year when it means the most. A lot has been asked of them this year and a lot will be asked of them in 2008." By Keith Cowing on December 13, 2007 4:21 PM. At a Lunar Lander Project Office Industry Day NASA announced that the name of the new human lunar lander project's LSAM (Lunar Surface Access Module) will be "Altair". A logo was also unveiled. By Keith Cowing on December 13, 2007 3:29 PM. 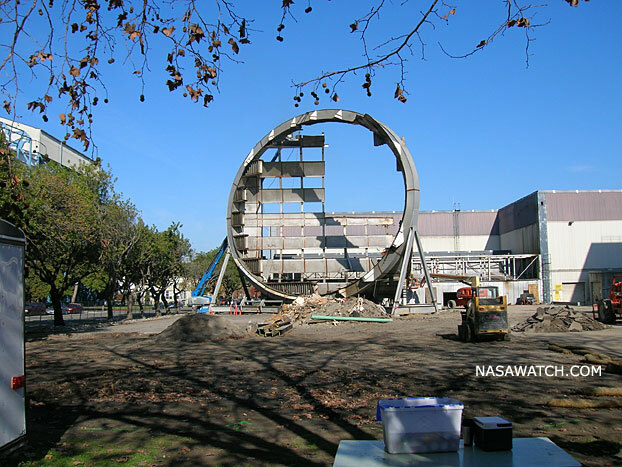 Of course, now that Ames has a Stargate, MSFC will try and take it away. 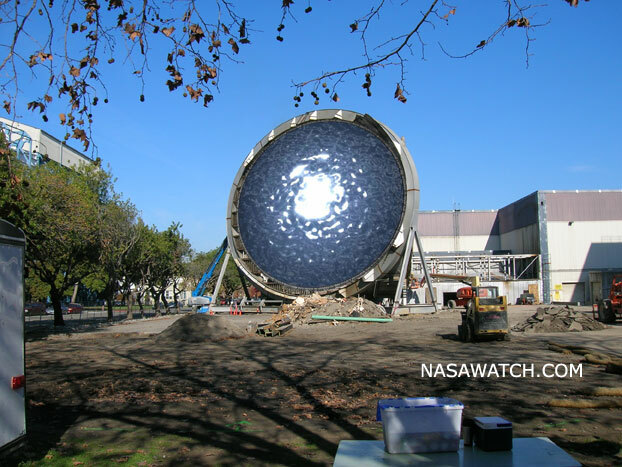 Editor's additional update: A NASAWatch reader has helped unravel this mystery. There is another operational Stargate. It would seem that ARC is tapping personnel expertise across the world - via Stargate - from CERN. They commute daily via Stargate from Switzerland! By Keith Cowing on December 13, 2007 2:25 PM. Editor's note: There is a press conference underway right now from NASA JSC regarding Expedition 16. A few minutes ago I heard several instances of NASAese - i.e. NASA people taking simple sentences and reformatting them so as to make them quasi-cryptic to people outside the agency. As is usually the case, several nouns and verbs were injured in the process. Kirk Shireman (speaking NASAese): "... we will deconflict these two ..."
English translation: "... we will resolve conflicts between these two ..."
Holly Ridings: (speaking NASAese)" "... we ingressed into Node 2 ..."
English translation: " ... we entered Node 2 ..."
By Keith Cowing on December 13, 2007 10:44 AM. "Hello! This is Arthur Clarke, speaking to you from my home in Colombo, Sri Lanka. As I approach my 90th birthday, my friends are asking how it feels like, to have completed 90 orbits around the Sun. Well, I actually don't feel a day older than 89! Of course, some things remind me that I have indeed qualified as a senior citizen. As Bob Hope once said: "You know you're getting old, when the candles cost more than the cake!" I'm now perfectly happy to step aside and watch how things evolve. But there's also a sad side to living so long: most of my contemporaries and old friends have already departed. However, they have left behind many fond memories, for me to recall." Video: What if Von Braun REALLY had his way - in the 1950s? By Keith Cowing on December 13, 2007 12:40 AM. Continue reading Video: What if Von Braun REALLY had his way - in the 1950s?. By Keith Cowing on December 12, 2007 4:11 PM. "The Boeing Company has been awarded an initial NASA contract valued at approximately $265 million to produce the Ares I crew launch vehicle's instrument unit avionics (IUA). The award follows Boeing's selection as the Ares I upper stage production contractor in August. The IUA provides the guidance, navigation and control hardware for the new Ares I crew launch vehicle, serving as the "brains" behind the rocket's ascent." By Keith Cowing on December 11, 2007 7:49 PM. "Startling evidence has been found which shows mammoth and other great beasts from the last ice age were blasted with material that came from space. Eight tusks dating to some 35,000 years ago all show signs of having being peppered with meteorite fragments." By Keith Cowing on December 11, 2007 5:49 PM. Editor's note: Some clever South Africans have depicted a shuttle landing - in the middle of Cape Town. Video below. Continue reading Today's Video: Hey, Is Cape Town a TAL Site?. By Marc Boucher on December 11, 2007 11:54 AM. NASA Watch may be unavailable between 2:30 - 4:00 p.m. today for scheduled site maintenance. By Keith Cowing on December 11, 2007 12:57 AM. "Internal NASA emails from the director of Shuttle Safety at the Johnson Space Center and the Shuttle Program Manager show how they struggled with the potential risk to astronauts' lives in assessing how to proceed with the launch of Atlantis in the wake of engine cutoff (ECO) sensor malfunctions. Aviation Week & Space Technology obtained exclusive copies of these emails, which are reproduced largely in full here on AviationWeek.com to retain the context intended by their authors." By Keith Cowing on December 11, 2007 12:18 AM. Editor's note: A monstrous arachnid managed to get past NASA KSC's crack security and crawl all over the shuttle before someone finally shooed it away. It took several minutes before the situation was brought under control. The terrifying footage is below. CAUTION: not for people suffering from arachnophobia. Continue reading Monster Mutant Spider at KSC. By Keith Cowing on December 11, 2007 12:01 AM. Editor's note: I will be on Federal News Radio Tuesday morning between 7:00 - 7:15 am EST (just after the news) to talk about HSPD-12. Hey, where are all the press releases? By Keith Cowing on December 11, 2007 12:00 AM. Editor's note:Something is really screwed up with NASA PAO. These two (very cool) press releases, one issued by JPL, the other by NASA HQ, never arrived in my email inbox - this despite the fact that I am on (or so I thought) every imaginable email distribution list NASA has. I stumbled across them elsewhere - and there is nothing wrong with my email server. First a screwed up telecon, now botched email LISTSERVs. Perhaps NASA should focus less on glitz, and more on content. Is The Vision for Space Exploration Dying? By Keith Cowing on December 10, 2007 11:46 PM. ... For all of these signals of patient ill health, the worst was articulated this week at a panel discussion as part of the celebration of the 50th anniversary of the 1958 International Geophysical Year. The statement was that the VSE has failed to connect to the American people. That single sentence goes to the heart of the problem, one that is far larger than missed schedules, delayed milestones and a dearth of funding. Despite the fact that year in and year out, Americans typically support the space program by a two-to-one margin, often the rhetoric, like perception, becomes reality." By Keith Cowing on December 10, 2007 10:50 PM. NASA Internal Memo From Wayne Hale: "Not done yet"
"... So I've decided: I'm in it for the long run. I don't intend to leave before the last wheel stop. There is plenty enough excitement and fulfillment to outweigh the biggest bonus or the fanciest office. There will be time for the future when it comes. Because we're not finished yet. I hope you are in it with me." By Keith Cowing on December 10, 2007 3:07 PM. Editor's note: I called into the telecon today 9 minutes before it began. Melissa Matthews (ESMD PAO) read down a list of reporters to confirm that they were on the telecon. She said that the order of the list was determined by how people confirmed (my confirmation was made by email on 7 December at 3:15:51 PM EST). When my name was called I confirmed that I was on the telecon. Later, when Melissa went down that list, my name was omitted. Everyone got to ask a question. When she asked if anyone was missed I said "yes - you forgot me, this is Keith Cowing" - several times. No response. Why these people play these games escapes me. Editor's update: PAO says that they called my name but heard nothing back. I have done these telecons a hundred items - from the very same telephone. What mystifies me is why NASA PAO is so utterly incapable of setting up a simple telecon with people. Earlier in the telecon someone said that the operator had cut some people off who had an open mike that was causing the echoes. Maybe they cut me off too. Oh well. Continue reading ESMD media Telecon notes. By Keith Cowing on December 10, 2007 2:00 PM. Editor's note: Despite official NASA PAO statements that no final decision has been made to baseline a water landing for Orion, the Constellation Program ISTIM Outbriefing to JSC Engineering Management paints a far different picture: "Landing mode - Nominal coast water landing, contingency-only land landing, cease/desist working nominal land landing, water landing environement definition per Team 0 recommendation, landing accuracy increased form 5 km to 10 km." This sort of confusion makes you wonder who is actually in charge of this program, doesn't it? By Keith Cowing on December 10, 2007 8:59 AM. "This first collection of 10 coins focuses on the eight planets in our solar system. This commemorative coin collection includes an extremely rare Pluto coin, the last Pluto-Hubble coin approved by NASA before the planet was decommissioned in 2006." By Keith Cowing on December 10, 2007 8:44 AM. "With NASA now actively planning for the day when astronauts will live for months on the moon or make the years-long flight to Mars and back, a potentially troublesome question is being raised with increasing urgency: Is the human body -- even a well-protected human body -- capable of living in space for long periods without suffering serious damage?" Editor's note: So what does Mike Griffin do? He slashes space life science research. By Keith Cowing on December 10, 2007 12:49 AM. "We report observations from the Spitzer Space Telescope (SST) regarding the frequency of 24 micron excess emission toward sun-like stars. Our unbiased sample is comprised of 309 stars with masses 0.7-2.2 Msun and ages from <3 Myr to >3 Gyr that lack excess emission at wavelengths <=8 microns. The results suggest that many, perhaps most, sun-like stars might form terrestrial planets." By Keith Cowing on December 10, 2007 12:13 AM. "NASA FY2009 Budget: We are full-swing in the budget season for FY2009. 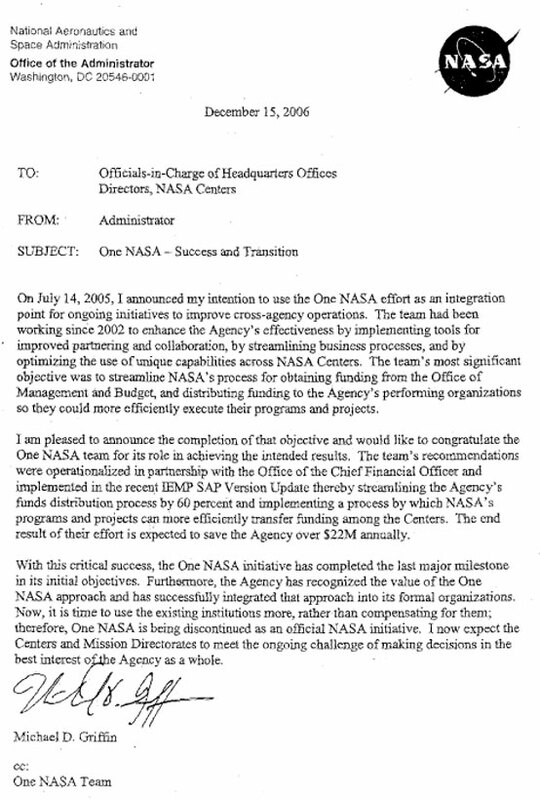 The agency received the FY2009 passback from the Office of Management and Budget (OMB) (this is the response to NASA's original budget submit). We continue with the discussion phase with OMB. The end result will be incorporated into the President's budget, which will be rolled out in February 2008. Then, Congress will take up the budget for its consideration." By Keith Cowing on December 9, 2007 12:27 PM. "(a) The National Aeronautics and Space Administration shall take all actions necessary in fiscal year 2008, including renegotiating necessary prime contracts and subcontracts and ensuring that they do not expire, in order to ensure the option of operating the Space Shuttle beyond the currently planned Shuttle end-of-operations date in 2010. These actions shall be accomplished using existing funds made available by this or any other Act, and shall include -- "
"Despite the objections of senior NASA officials and Columbia disaster investigators, key members of Congress are pushing hard to extend the life of America's aging space-shuttle fleet beyond 2010, potentially risking astronaut lives as well as the agency's program to return to the moon." By Keith Cowing on December 9, 2007 10:34 AM. "The launch of space shuttle Atlantis has been rescheduled for no earlier than Jan. 2, 2008. The postponement will give engineers time to evaluate false readings from the engine cutoff sensor system that measures liquid hydrogen in the external tank. Of the four engine cutoff sensors, ECO sensor number three gave false readings during Sunday's launch attempt. The sensor system is one of several that protect the shuttle's main engines by triggering their shut down if fuel runs unexpectedly low." By Keith Cowing on December 8, 2007 11:26 PM. 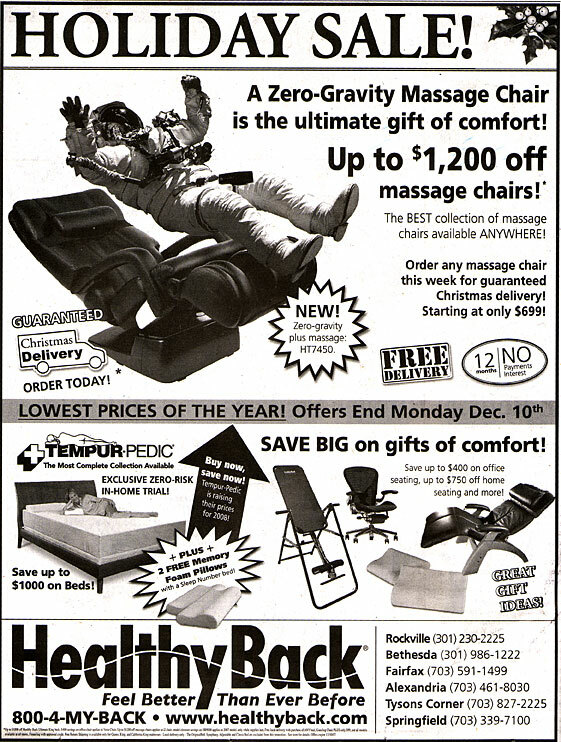 Editor's note: This astronaut endorsement of a recliner chair appeared in Saturday's Washington Post. Seems that some people already like the idea of a NASA "brand". Click on image to enlarge. "The legislation would allow the Agency to seek partnership opportunities from corporations, universities, individuals, and other entities and accept money for the Innovation Fund in exchange for appropriate promotional programs. The legislation contains a number of safeguards designed to uphold the high standards of the agency, and preclude the use of corporate logos on NASA launch assets." By Keith Cowing on December 8, 2007 2:30 PM. "Before going to Mars, NASA may need to perform a dry-run by sending astronauts on a shorter voyage to orbit a near-Earth asteroid, a former space agency scientist said Friday during a lecture in Huntsville. The mission would be similar to the Christmas 1968 Apollo 8 mission to orbit the moon that taught NASA men could be sent safely to lunar orbit and return to the Earth, said Dr. Wes Huntress, a former NASA associate administrator for science." By Keith Cowing on December 8, 2007 1:30 PM. "NASA has until July 2008 to prepare for a preliminary design review, but the report noted that existing gaps "are fairly significant and challenging, given the complexity and interdependencies in the program." GAO has recommended that NASA establish a more sound business plan before moving beyond the preliminary design review, even if that means delaying the program's next stage. One of the most significant problems, according to the report, is identifying program requirements. Ares I and Orion development must be synchronized, and NASA has identified this condition as one of the top risks of its effort. In addition, at least 14 of the 57 hazards identified by the integrated risk management system tracking the Ares project address the issue of instability." By Keith Cowing on December 8, 2007 10:52 AM. "Keith Cowing, editor of NASAWatch.com and a former NASA scientist, agreed. "This may come back to bite NASA in the very near future when it realizes that it needs some of the very people it is now imposing strict background requirements upon." Implementing the policy government-wide could actually be detrimental to homeland security because of the resulting "mix of unfilled positions at federal agencies -- positions that are vital to our nation's economy and security," he said." By Keith Cowing on December 7, 2007 7:45 PM. Editor's note: NASA Watch has learned that there will not be a launch attempt on Saturday. The next launch attempt will be made on Sunday. By Keith Cowing on December 7, 2007 7:02 PM. "The post Mission Management Team meeting news conference has been pushed back to no earlier than 7:30 p.m. EST. It is not a crack. During a routine pad inspection, teams identified scuff marks on the LOX Feedline brackets. These scuff marks are within the allowable limits and there no issues." By Keith Cowing on December 7, 2007 3:42 PM. "I don't like it. I consider it to be unseemly in the extreme, and unwise strategically for the United States to be dependent on any other nation for any other thing. I could not be more clear on that. This is where we are, and I am doing the best I can to plot our course out of it. I did not get us into this position. . . . If you think I like it, you would be wrong." These were the words of NASA Administrator Michael Griffin at a very sobering hearing of the Senate Space, Aeronautics, and Related Sciences Subcommittee." By Keith Cowing on December 7, 2007 10:07 AM. "Engineers have confirmed the cause of the attitude disturbances on GOES-12 that started after the North/South maneuver. We believe there is a leak in the oxidizer line of thruster 2B. We were successful yesterday in isolating the thruster. This evening, we are planning to go into normal attitude control mode. Engineers will be monitoring the spacecraft through out the weekend. On Monday we will determine whether to begin normal imaging and sounding operations. GOES-10 continues to support the East satellite imaging and sounding operations. Since yesterday GOES-10 GVAR and all auxiliary services, including EMWIN, were broadcast simultaneously through GOES-10 and GOES-12." By Keith Cowing on December 7, 2007 9:49 AM. "A new Congressional Research Service paper came out Dec. 3 titled "U.S. civilian space policy priorities: reflections 50 years after Sputnik." It's a nice wrap-up of policy in the past as well as the direction for space policy in the future. The report posits that there are four factors contributing to the advancement of space technology since Sputnik (launched on Oct. 4, 1957): "the compelling need to explore and discover; national defense; prestige and confidence in the U.S. scientific, technological, industrial and military systems; and scientific observation and experimentation to add to our knowledge and understanding of the Earth, solar system and universe." By Marc Boucher on December 7, 2007 6:02 AM. "The launch of NASA's space shuttle Atlantis will take place no earlier than Saturday, Dec. 8, at 3:43 p.m. EST. Thursday's scheduled liftoff from NASA's Kennedy Space Center, Fla., was postponed because of a problem with a fuel cutoff sensor system inside the shuttle's external fuel tank. The fuel cutoff sensor system is one of several that protect the shuttle's main engines by triggering their shut down if fuel runs unexpectedly low. Launch Commit Criteria require that three of the four sensor systems function properly before liftoff." By Keith Cowing on December 6, 2007 7:10 PM. "Amidst the regular burden of work, some may appreciate this short description of an emotional ceremony I attended this past Sunday at the United States Naval Academy in Annapolis, Maryland. It was not widely reported in the media but held a very special significance for NASA employees, in particular for those who happen to be runners. I'm a runner and, while there have been many times when I've been tempted to break down on a racecourse, this was a special time." By Keith Cowing on December 6, 2007 7:04 AM. "JPL employees returned to court Wednesday as a panel of three federal judges heard arguments about extending a temporary injunction against NASA's new employee background checks. The 9th U.S. Circuit Court of Appeals judges posed sharp questions to the government lawyer about the necessity of the background checks, which include questions about drug use and drug treatment, as well as an open-ended waiver releasing personal information." By Keith Cowing on December 5, 2007 6:07 PM. "Senator Kay Bailey Hutchison (R-Texas) today was named the new Ranking Member of the Aviation Operations, Safety, and Security Subcommittee. Senator Hutchison will replace current Ranking Member Senator Trent Lott (R-Miss. ), who announced last week that he is resigning at the end of this year." By Keith Cowing on December 5, 2007 12:27 PM. Editor's note: Multiple sources also report that Mike Griffin (with the prompting of his special helper Marcia Ivins) was not at all happy with what he was told about Orion and Ares 1 progress as discussed at the Integrated Stack Technical Interchange Meeting last month - especially with regard to the path Skip Hatfield was taking things. So, in the time honored NASA tradition of shooting the messenger, Hatfield was reassigned to that new "Special Assistant job" i.e. Mike Griffin had him fired from his Orion job. NASA ESMD PAO has not responded to any of the questions I have sent them on this topic. Stay tuned. ESMD Cannot Answer A Simple Question: "Water or Land"? By Keith Cowing on December 5, 2007 12:02 PM. Editor's note: Last week I began to receive mutliple reports from NASA sources that the Constellation program has baselined a water landing for the Orion spacecraft. After multiple requests, NASA ESMD PAO replied to me a few moments ago. From ESMD PAO's Melissa Motichek: "I can tell you that there has not been a final decision on the nominal landing mode (land vs water). The point of departure architecture assumes a nominal water landing to begin the analysis cycle. We will re-address this issue as analysis of contingency water and land landing progresses." To which I replied: "You have simply confused me further. The "point of departure architecture" used to call for a land landing. Now you say it is a water landing - yet you say that the final decision has not been made." In August 2007 both Doug Cooke and Doc Horowitz told me that this decision had not been made (contrary to other reports) and that studies were still underway. It is quite obvious that ESMD PAO (and therefore ESMD) is incapable of making simple 'yes' or 'no' answers to simple questions. Let me try this again: has NASA decided to land Orion spacecraft in the water as its basic plan of flight operations? "Q. How did Orion manage to lose the weight? A. In their recent weight scrub effort, the Orion team settled on a targeted water-based landing off the California coast as the nominal landing mode, which the program has accepted." This really has me perplexed. Jeff Hanley says it that Orion is now landing in water yet ESMD PAO at NASA HQ (who says only what their management tells them to say) informs me that no decision has been made. Small wonder people have their doubts about ESMD and their spacecraft designs. One hand clearly does not know what the other is doing - or saying. By Keith Cowing on December 5, 2007 9:35 AM. Editor's note: As she introduced a segment to air tomorrow (Thursday) on NBC's Today show featuring Virgin Galactic's Richard Branson, perky NBC host Ann Curry said "they told me that you could not be an astronaut if you were a girl." Really Ann. Just who are "they"? By Keith Cowing on December 5, 2007 9:07 AM. Editor's note: Dilbert cartoon strip has had a series on space tourism running this week. By Keith Cowing on December 5, 2007 8:48 AM. "Though drastically scaled down by a string of budget cuts, the space station is a crucial nursery slope for future space missions, such as the Bush administration's much-publicised hopes for a moonbase and a crewed voyage to Mars, said Cowing. "You've got to practise things first. To say the purpose of the space station is to be fixed is to some extent true. There's a difference between sitting down here and thinking 'will this work in space' versus being there and testing it out in real conditions." By Keith Cowing on December 4, 2007 5:17 PM. 1) The "partridge in a pear tree" is a classic example of conflicting requirements that cannot be satisfied concurrently: Either the partridge will eat the pears, rendering the tree ineffective, or it will not, and the bird will die. Ongoing continuous replacement of partridges and/or pears would be the inevitable outcome of deployment. The Constellation program is directed to deploy either a partridge or a pear tree, but not both. ..."
By Keith Cowing on December 4, 2007 12:28 PM. "Challenger Center for Space Science Education is pleased to announce that in January 2008 William Readdy will assume the important leadership role, succeeding astronaut and business executive, Dr. Joseph Allen, Ph.D. as chairman of the board. Readdy brings over three decades of experience in the aerospace industry to Challenger Center. He had a distinguished career with NASA, as an astronaut and as associate administrator for space operations." "Leroy Chiao, Carol Staubach, Keith Cowing"
By Keith Cowing on December 4, 2007 11:35 AM. "It does not take a rocket scientist to understand that categorically refusing to release government-financed aviation safety research data to the public using the argument that it might adversely affect corporate profits is egregiously wrong. We are pleased that all the raw data have been released to your Committee and that NASA has pledged to release all of the properly de-identified data to the public by December 31st, 2007. It is regrettable that this was not NASA HQ's initial decision. It is, however, worrisome that NASA now appears to be hedging on its public promise of full release of all legally releasable information before the end of the calendar year. It is ridiculous to argue that NASA will take a year and needs to hire expensive outside consultants to handle a data-filtering process that can best be handled by those aviation experts who designed and implemented the survey and who are most experienced at releasing de-identified aviation safety reports. Taxpayers are much more likely to trust this process if it is performed by scientists in the trenches motivated by their passion for aviation safety than if it is led by political appointees or senior managers who cannot be expected to render an opinion that conflicts with that of the Administration." By Keith Cowing on December 4, 2007 11:32 AM. Steve Wozniak, Co-ounder, Apple Computer"
By Keith Cowing on December 4, 2007 10:54 AM. "In preparing for the evaluation of Mars Scout Concept Study Reports for the final selection, NASA identified an organizational conflict of interest. NASA determined action had to be taken to resolve the conflict in order to maintain a fair competition." By Keith Cowing on December 4, 2007 10:34 AM. "NASA still doesn't know what's causing the big rotary joint on the starboard side of the International Space Station to chew itself up, but they're closing in on a plan to overcome the problem. The first step comes as early as Thursday, when the space shuttle Atlantis is set to lift off for the ISS." Holding Back Israel - To Hold Back India? By Keith Cowing on December 4, 2007 9:13 AM. "The September launch of an Israeli spy satellite from India, which now faces months of postponements, was canceled due to "last-minute" pressure by the United States, the Indian press reported Monday....The paper hinted that the reason for the American pressure was to prevent India from obtaining powerful military platforms. Earlier this year, the paper said, the US curtailed Indian plans to develop missiles with a 5,000-kilometer range and advised it to only manufacture missiles with a range of 800 km." By Keith Cowing on December 4, 2007 8:32 AM. "Next August, after 20 years of hype, disappointment, blunders, triumphs and peerless glittering vistas of space and time, and four years after NASA decided to leave the Hubble Space Telescope to die in orbit, setting off public and Congressional outrage, a group of astronauts will ride to the telescope aboard the space shuttle Atlantis with wrenches in hand. That, at least, is the plan." By Keith Cowing on December 3, 2007 10:26 PM. "Every now and again even the most cynical of us stumble across something so simple - and yet profound - as to take one's breath away - and remind us of why we are so captivated with space exploration's broader ramifications." Editor's note: I need to post a link to this video (below) at least once every few months. Indulge me. Continue reading Simple Video - Big Message. By Keith Cowing on December 3, 2007 9:09 AM. "Now, every time that I fly, I think about NASA's contributions to our air transportation system, and how remarkable our nation's progress has been in creating a very safe system, over a relatively short span of time, that supports nearly 50,000 flights in a 24-hour period. I am also excited about the possibility of a future system that safely meets our nation's growing demand to take to the skies while ensuring that the environment is protected." "Over the course of a year that many airline passengers would rather forget, most attention has been focused on travel woes created by record-setting flight delays. But another trend may be causing as much havoc and frustration for passengers: Planes have never been so packed, federal data show." By Keith Cowing on December 3, 2007 8:45 AM. "But some Chinese Internet users have questioned its originality after comparing it with an almost identical lunar image from the U.S. National Aeronautics and Space Administration in 2005." Editor's note: More proof that China is gaining on the U.S. with regard to space technology. It took several decades before the fake Apollo image crowd got noticed in the U.S. In China it has taken only weeks. By Keith Cowing on December 2, 2007 9:18 PM. "A union representing NASA employees accuses the agency's administrator of unfairly tarnishing agency employees by disparaging and misrepresenting a federal air safety project. NASA weeks ago drew intense criticism for withholding results of the research, fearing it would upset travelers and hurt airline profits. The union disputed Michael Griffin's criticisms of the program, in which thousands of commercial and private pilots were interviewed. It said his comments to Congress at an oversight hearing in October appeared to reflect fears the pilots might report to NASA higher rates of safety problems than are recorded by Federal Aviation Administration's own monitoring." By Keith Cowing on December 1, 2007 9:25 PM. "Nobel laureate Steven Weinberg, a theoretical physicist at the University of Texas, is one of many researchers frustrated by the priorities NASA has set, and he has publicly discussed the AMS issue as a prime example of what he thinks has gone wrong. If the instrument were ferried to the station, he said, its study of cosmic rays "would be the only significant science ever done on the space station." Editor's note: This just goes to show you that really smart people can also be ignorant - and wrong. It is these predictions of things yet to come which are really annoying. Unless, of course, Weinberg has also invented a time machine which allows him to see what will be done on the yet-to-be-completed ISS. If so, I am certain NSF would love to have him sit on their peer review panels and rate the future results of all proposed projects. That said, it is sad that Mike Griffin's priorities do not include the science the ISS is supposed to have been built for in the first place. Rather, he just wants to be done with it. Reader note: "I would find the quandary (and Congressional, and Nobel-laureate, whining) over the AMS's potentially being grounded amusingif it wasn't so tragic. Where are all those folks who criticizedno, vilifiedSean O'Keefe for his decision to NOT fly a Hubble repair mission? 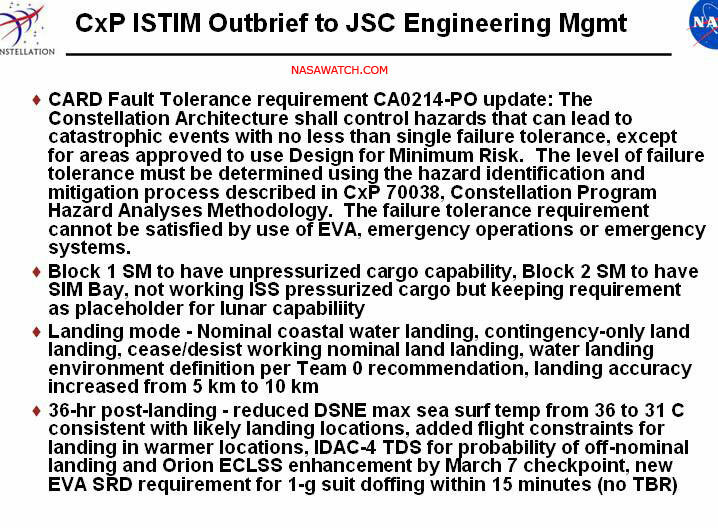 If that well-considered assessment of safety versus science had been held to (recall, the decision was made in light of comparably capable ground-based assets that will be available until the Webb ST gets delivered) instead of being dumped (under extreme Congressional pressure, mind you), a slot would exist on the 2010-constrained shuttle manifest to launch the AMS to the ISS. Too bad that the powers that be have so cleverly painted international science into a corner." "The whole purpose of having an international space station . . . is to be able to do these kinds of extraordinary science experiments, such as the Alpha Magnetic Spectrometer," Nelson said. "It is almost like cutting off our nose to spite our face."